This entry was posted in Pallets, Wood Pallets on September 28, 2017 by visiture. Comparing Different Pallet Types: Which One Is Best for You? Need to purchase pallets for your new business? Not sure which type to choose? This is a common occurrence for many business owners, and it can be confusing to decide which ones would best suit your needs. 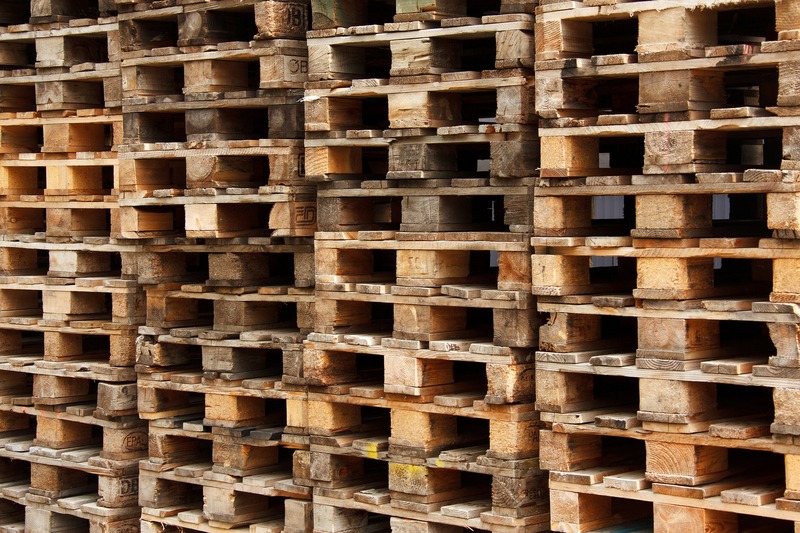 For those who are new to pallet types, the following is a guide to which pallet types may be best suited for your transport and business needs. Metal pallets are generally made from aluminium and steel, and are used for the transportation of heavy goods, including at-sea storage, air freight, and outdoor long-term storage. Over the years, the use of aluminium pallets has become increasingly popular with many industries. This is because they provide higher-strength properties than other form of pallet types. Catering businesses and restaurants are also using metal pallets because they are easy to keep sanitary. Ideal for chemical and food industries because they’re easily cleaned. Recyclable, time and time again. Don’t cause splinters like wooden pallets do. Mostly free of pests and bugs. Stronger than plastic and wooden pallets. Don’t decay, and they are highly weather-resistant. May cost more in transportation. Heavier compared to other pallets. Plywood pallets are designed for holding light- to medium-weight products. They offer a durable and strong packaging solution for many industries. Ideal for layer stacking and rack stocking. Plywood features a clean smooth surface area. Have minimal absorption of moisture. Perfect for transportation and shipping due to their lightweight, strong design. Tends to be more difficult to store in racking systems. If left outside, can suffer water damage. 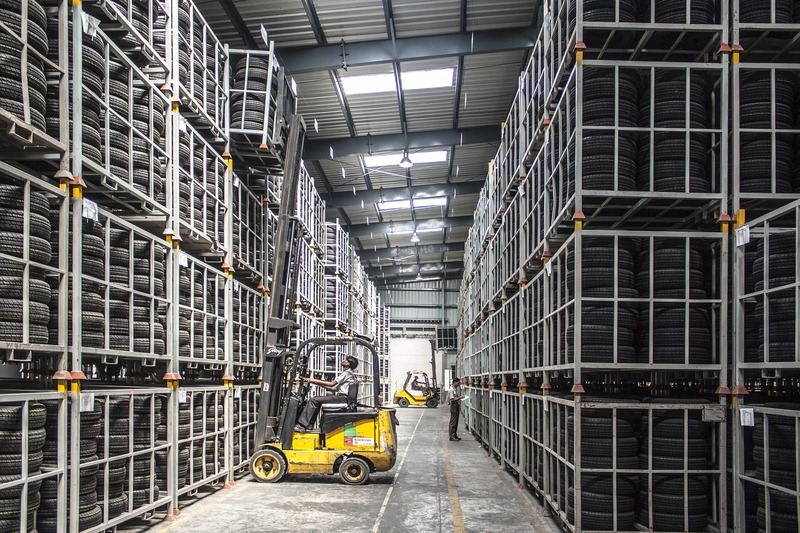 Moving between warehouses can be limited as many warehouses don’t store these pallet types. Available in various designs, wooden pallets are ideal for holding heavier products that require a one-way flow in your warehouse. Durable and strong in design. Tend to be less expensive than metal-based pallet materials. Feature high friction compared to metal and plastic pallets. Easy to construct in a short amount of time. Can be recycled with paper and mulch. Can be easily fixed with recycled materials. Easy to repair, as broken boards can be replaced. Tend to be more susceptible to protruding nails, splinters, shrinking, and warping, which can lead to continual reordering. If they become wet, they can be very difficult to clean. The wetness can also cause fungi and bacteria to grow. Presswood pallets are constructed with high pressure and high temperature, creating a solid piece from fibers of dried wood. Can be effectively stacked on top of each other. Provide great strength, though lightweight. Rack storing can be difficult. If left outside they can succumb to water damage. Many warehouses store these pallets, so movement between warehouses tends to be limited. This entry was posted in Metal Pallets, Pallets, Plastic Pallets, Wood Pallets on December 31, 2015 by madden_david. 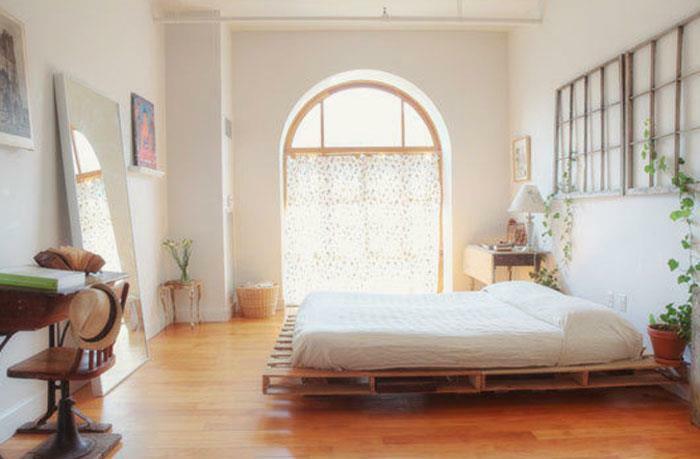 Do you have old pallets just lying around? Want to recycle them for home project? This is a great idea! 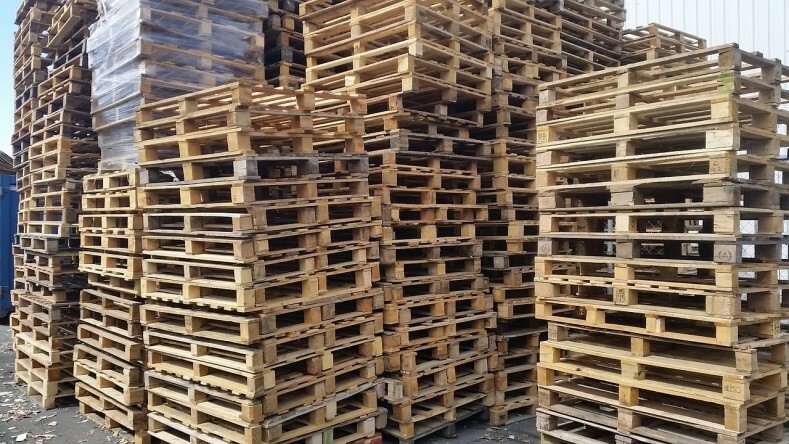 After vigorous use within businesses, industries, and warehouses, pallets can easily be transformed into furniture or other works of art by the creative at heart, although, before you jump in and start making your pallet creation, it’s important to remember that some pallets may be dangerous. This is due to possible chemical spills and treatment methods that may have been used to make them. 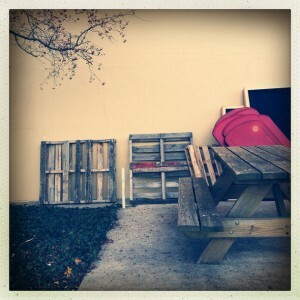 The following is a guide to preparing wooden pallets for upcycling projects without causing harm to yourself. 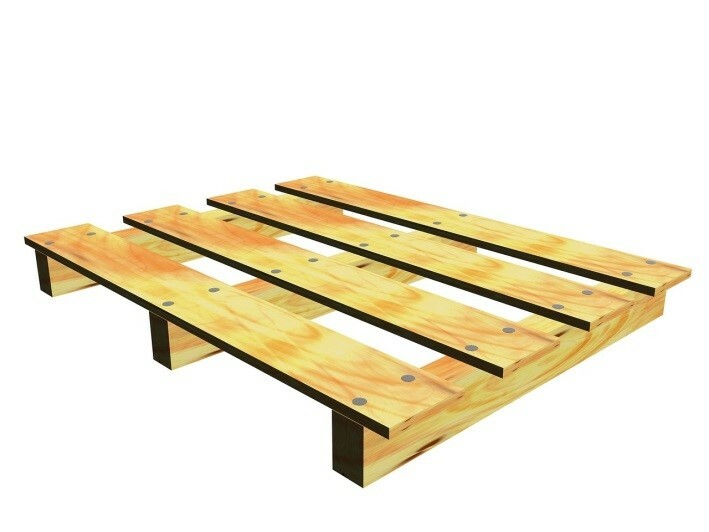 Because pallets are used for a variety of transportation needs, they can become susceptible to contact with spills, chemical liquids, and other hazardous products. The first step to choosing the right pallet is checking the pallet thoroughly to make sure there aren’t any spills on it. If there are any sorts of strange discolorations, stains, or spills, it is best to discard them. Make sure you always use stain-free clean pallets. The next thing to check is the stamp marking on the sides of the pallet. This marking can be seen as words, numbers, or symbols painted, etched, branded, or stamped into the pallet sides. This marking means that the wooden pallet has been treated especially for safety. Most domestic transportation pallets are non-treated and don’t have any visible markings. IPPC Logo – This means that the pallet comes from an international source and doesn’t have a seal of approval. You won’t know what it has been used for. DB: Debarked – This rating means that the bark was removed using a specialized cutting tool leaving the wood untreated. DB rated pallets are chemical free and safe to use. HT: Heat-Treated – This rating means that the pallet has been heat treated in a kiln for up to 30 minutes to ensure all chemicals and bugs are removed. Pallets which have this rating are safe to use and are untreated. MB: Methyl Bromide – Pallets which are treated with methyl bromide aren’t safe to use. This is a poisonous fungicide that kills fungus. 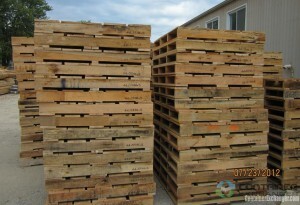 These types of pallets are banned within Canada and should be avoided. EPAL: European Pallet Association Logo – This means that the pallet has been heat treated and debarked. EUR: EPAL Older Version – Pallets such as this are now rare and should be avoided unless they have been EPAL approved. Colored Pallets: Colored pallets are generally used to ship chemicals and tend to be more exposed to spills. It is best to avoid using colored pallets for recycled woodworking projects. Pry Bar, Hammer, and Cat’s Paw – To help break your pallet apart you can use a cat’s paw, hammer, and pry bar. These items provide easy manipulation of the boards for fast and easy disassembling. Nail Punch – Nail punches are great for driving those stubborn nails into the wood that you can’t get out. This method can be used for spiral-shanked nails and stubborn screws and ring nails. Oscillating Tool – To make quick work of rusty nails, simply pull the boards as far apart as you can and use an oscillating tool to try to loosen the nails from the boards. Once your pallet has been broken down, you still have to cut, shape, and sand your pallet boards before adding the finishing touches. When cutting your pallets into shapes, it is advised to use sharp cutting tools, such as a saw. If you have to do circular cutting for a more decorative touch, it is best to use a jigsaw or something similar. Exposed pallet wood tends to be rough and may give you splinters. It’s best to sand your wood back before assembly of your project. This allows you to make your wood smooth to the touch. To put your project together and add the finishing touches, it’s best to use new nails or screws, along with wood glue, to help secure your piece together. If painting, try to use appropriate paints that can be used on wooden surfaces. Lastly, it’s important to give your new wooden pallet project a final lacquer-type coating which helps to protect the surface area from scratches and other issues. 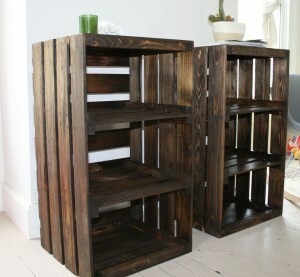 As you can see, you can easily recycle old pallets to make amazing furniture pieces. So, what will you be making out of your pallets? This entry was posted in Wood Pallets on November 6, 2015 by madden_david. 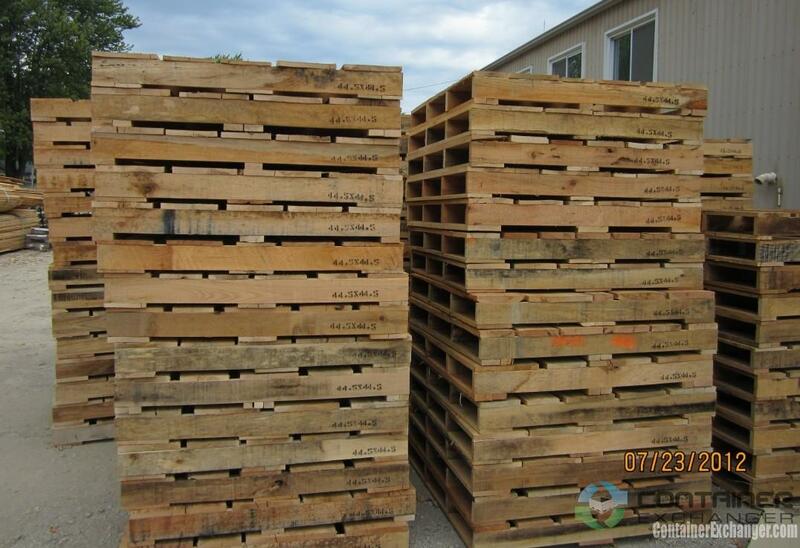 Pallets used for shipment purposes are one of the most common waste products in this country. Because there are so many of these finding their place in landfills, more than ever, people are repurposing wooden pallets and integrating them into their homes and businesses. 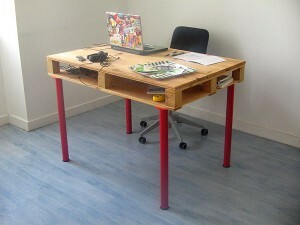 Projects concerning the repurposing of wooden pallets are low in cost and they are economically friendly. After use, most wooden pallets are tossed into the garbage. Because of this, those looking to get creative with wooden pallets can generally get these at a business for next to nothing. 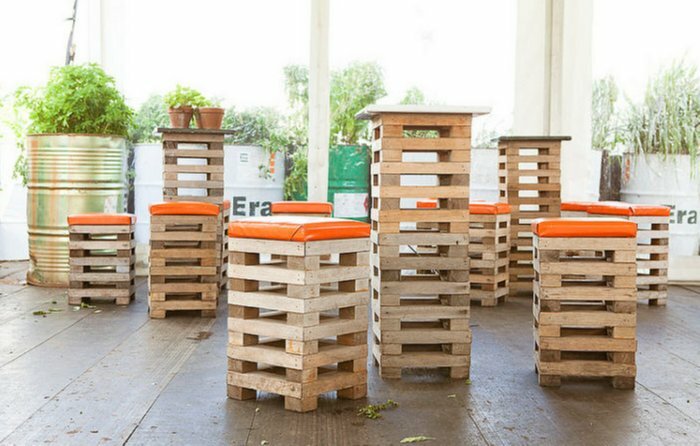 These pallets are multipurpose structures can be transformed into many things with a little creativity. 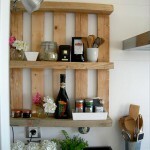 There are literally thousands of great looking, professional projects that can be made with repurposed wood pallets. Many home and business owners are reusing wooden pallets for furniture and storage solutions. The range of ideas concerning wood pallets is practically limitless. 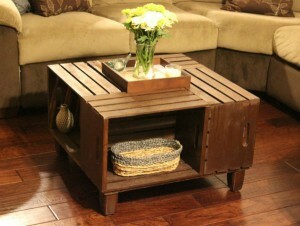 One popular use for reclaimed wooden pallets in a business or home is a coffee table. Wooden pallet coffee tables are actually a notable statement piece and can be found in many furniture stores now. It can be made to look high end or industrial, depending on what the person wants. Another way of incorporating used wooden pallets into the home or office is to actually take them apart and use them as wainscoting. This looks absolutely beautiful. 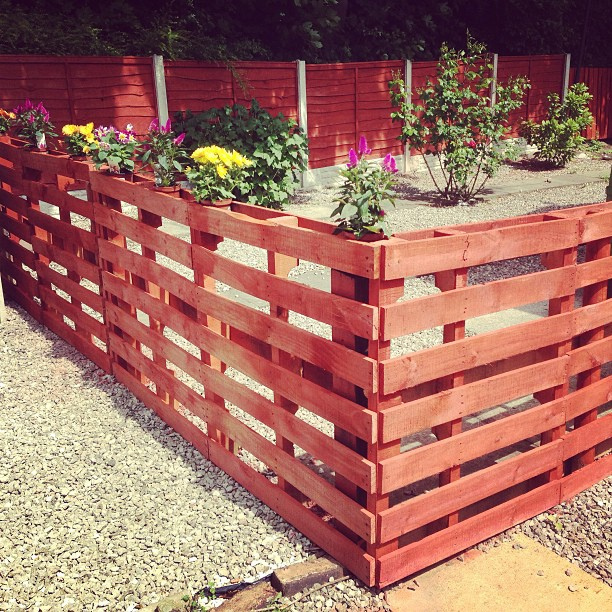 Recycled wooden pallets can be used to make garden fences for the home, or even a rustic garden walkway. This will add a sense of charm to the landscape. 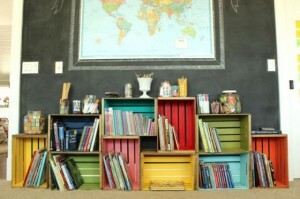 Making shelves or bookcases from wooden pallets is also very popular. 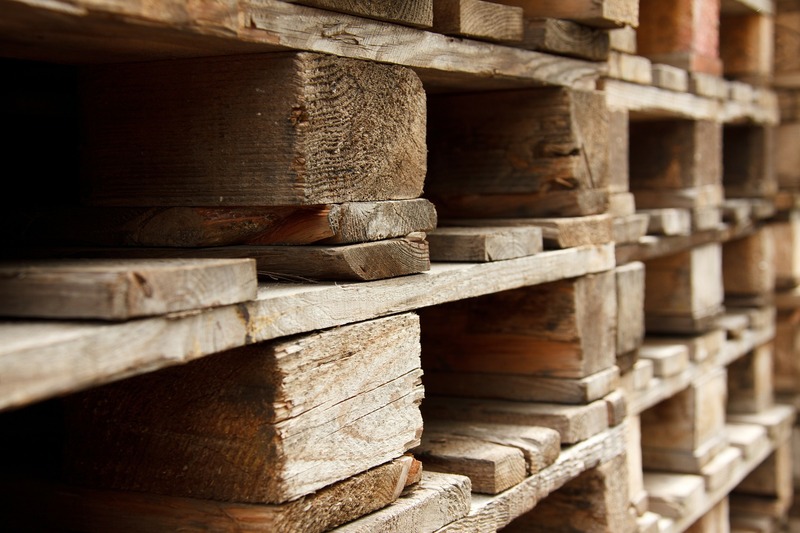 There are thousands of ways a business or homeowner could reuse wooden pallets. From desks to chairs, wooden pallets can be transformed into beautiful pieces of art. When remodeling an area, the materials used in the project can significantly impact the cost. Reusing wooden pallets is beneficial and sustainable. It is also resistant to decay. How can one go wrong in recycling something that is free and transforming it into a beautiful work of art? This entry was posted in Pallets, Wood Pallets on November 14, 2014 by madden_david. Ready for some DIY recycling projects? 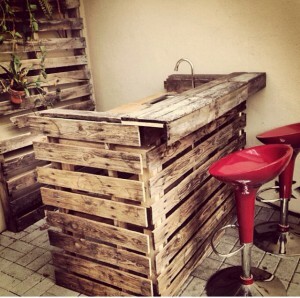 Don’t know what to do with those wooden pallets lying around your back yard? Tired of seeing those old wooden crates stacked in your garage? Here are some creative ideas we are eager to share with you! We all know the three R’s: reduce, reuse, and recycle. Although they might seem like something the modern man thought of when he realized his actions were damaging the environment, the truth is this is an old dictum. Recycling, especially, isn’t something new. Almost every culture from the beginning of time has practiced recycling, or the art of turning trash into useful items. For example, every time the ancient Romans conquered a new region, they melted down old metal and turned it into statues. They also recycled coins, jewelry, and old statues. Recycling can be a pretty daunting task, we have to admit that. Melting an old can and turning it into a new one isn’t that exciting. Luckily, creative reuse comes to the rescue. With a little imagination and some crafting skills, you can turn almost any boring, broken, or useless object into a piece of art or home decoration. You could, for example, turn a plastic bottle into a chandelier or some used plastic straws into a decorative curtain. Time to empty the recycle bin, clean the basement, and turn your potential junk into furniture pieces or home decoration! We have some creative ideas about how to recycle wooden pallets, wooden crates, pallet tanks, and wire baskets, and we are eager to share them with you! Have a look and give them a try! Wooden pallets are very popular. They make the transporting of nearly any product easier. In a single move, a forklift operator can lift a pallet loaded with shampoo, groceries, engine spares, cereals, or nearly anything you can think of from the truck to the warehouse, or the other way around. Did you know that there are more than 2 billion pallets in the USA alone? 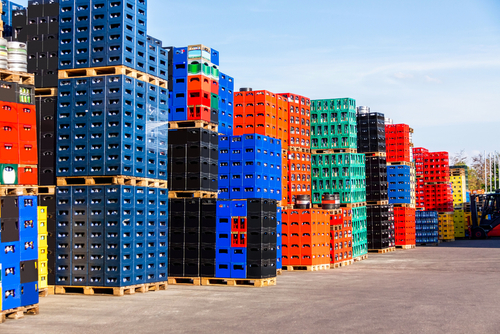 Annually, more than half a billion pallets worldwide are added to the staggering number already in existence. Statistics vary regarding how many wooden pallets end up at the junkyard, but some estimates claim 200 million wooden pallets in the US alone are thrown in the landfill every year. Not long ago, the only “recycle” use for a pallet would be to fuel a bonfire. But, as we know, mankind is extremely creative. We have, after all, turned sand into the silicon chips that drive our computers, smartphones, tablets, and the rest. We’ll have to admit, turning something into a piece of furniture might seem like a job suited for a professional carpenter. 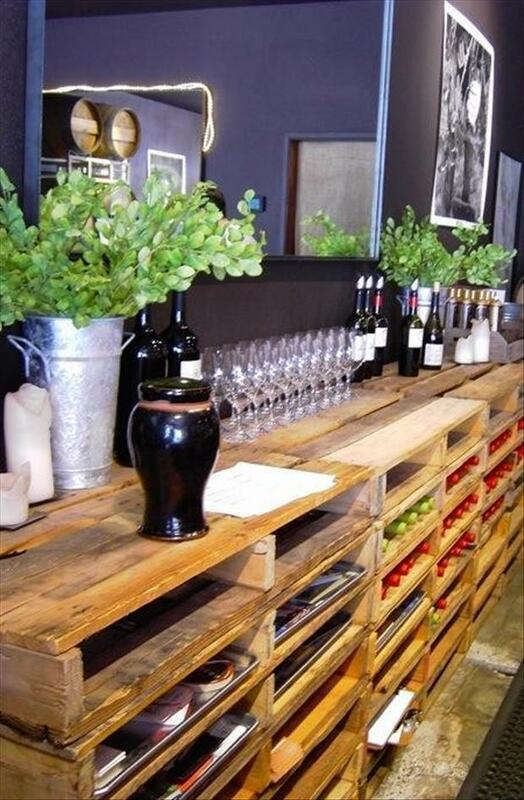 However, there are plenty of easy things to do with pallets! Turning a them into a fashionable item of furniture is generally so easy that anyone with a little crafty enthusiasm can do it. Even if you never handcrafted anything before, a little imagination and some elbow grease is all you need to get started. Read on for some inspiration about want you can do with a worthless wooden pallet! See, you do not need a MBA in Woodcraft to build this bed. With a hammer, a few nails, a saw, and an extra pair of hands, you can have great father-and-son DIY projects using wood pallets. As a matter of fact, this is so simple that two children, with some guidance, could make this for mother’s day. Make sure that you use pallets that are the same height. Ensure that you sand away splinters and rough pieces or the pallets may damage the fabric lining of your expensive mattress. For this, all you need to do is stack them. This will create a wonderful retro wine and/or food rack. You could even use this to create a very trendy vibe for a restaurant. Think of the money you will save on the decorations. To save yourself some time, make sure that the pallets you bought are all the same size. Seeing that you will be using these pallets in an environment where there is food, make sure that the wood is clean and free from spills like oil or other pungent chemicals. Apart from the obvious health risks, strong chemical smells can negatively influence the atmosphere that you are trying to create. You don’t need a crafting bone to put together a wooden pallet shoe rack. 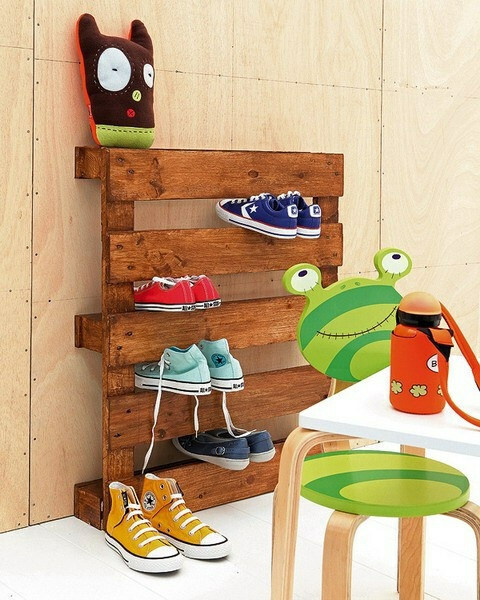 It is, in fact, a three-step process: get a wooden pallet, prop it against the wall in your hallway, and start storing your shoes. No hammers, no effort, no trouble! Of course, you can paint it or accessorize it if you wish so. 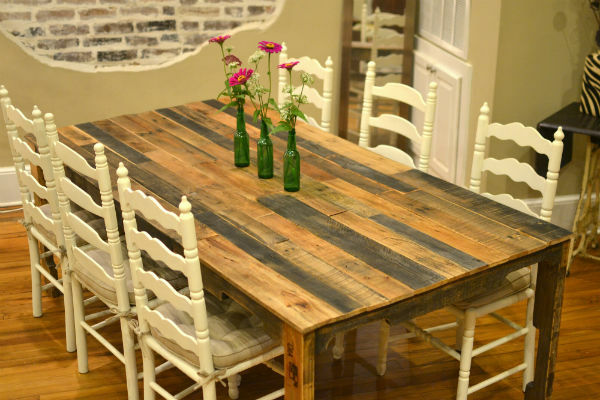 A recycled wooden pallet table isn’t only a great piece of furniture, perfect for both indoor and outdoor use, and is also extremely easy to build. To start, get yourself some pallets. It goes without saying that the pallets shouldn’t be too broken down and can still hold themselves together. Also, make sure that the pallets haven’t been chemically treated. Now, that you have the basic materials, start by cleaning and sanding the wood. For a simple coffee table, just stack and screw two pallets one on top of the other. You can add a custom-cut glass top for a more modern look. For more challenging DIY projects using wood pallets, deconstruct the pallets and remove all rusty nails. After individually brushing and sanding the slats, start combining the pieces together. Get creative by changing the size, the color or even the design of your future dinning or coffee table. Want a cool computer desk? You can easily make one out of wooden pallets. Go get yourself some pallets, a box of assorted wood screws and sturdy legs. Take the pallets apart, clean them up a little, cut them if you have to, and then screw them together. Sand down the wood to smooth it and tah-dah – behold your new, fabulous computer desk! If you want to avoid the disassembling process, find a four-way entry pallet – it will save a lot of time and effort. How about you accessorize your bar with some cute pallet bar stools? They are handy and fairly easy to make. Start by choosing the height of your stools. Then, after you’ve cleaned and sanded down the wood, start disassembling the pallets so that you have enough planks for the different parts of your soon-to-be bar stools. Cut the seat boards and secure them; add the legs and secure them as well. Now, all you have to do is paint your new stools and start using them. 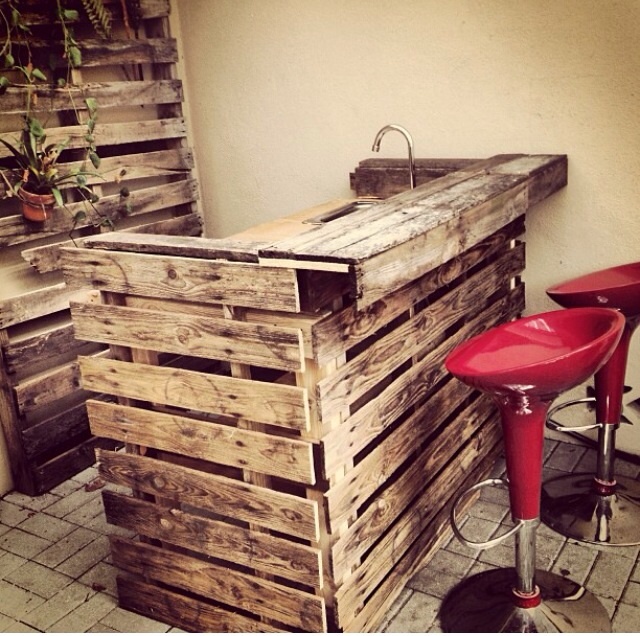 Now, if you’ve started making wood stools, why stop here and not craft a pallet bar as well? All you need are 2 wooden pallets and some traditional accouterments. Clean them, paint them, glue them together, and before you know it, you just build yourself pretty wood-bar where all the fun will take place from now on. You don’t have to be a professional DIYer to make a sofa from scratch. Yes, you heard me – you can create a cozy sofa from practically nothing. Cut a wooden pallet in half and screw the pieces together at a 90-degree angle. Add some legs for stability. Sand all outer surfaces, paying special attention to the edges and corners. 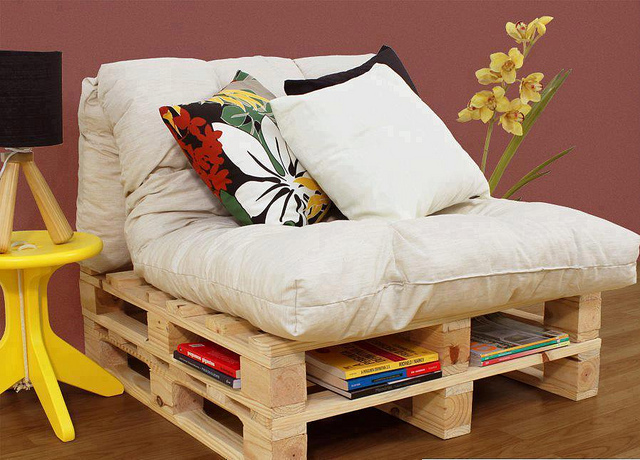 Paint the pallets, add some cushions, and there you have it – a pallet sofa you built yourself. It will be a great addition in your living room, and a perfect extra napping space. Sometimes, space can be a luxury not all of us can afford. Living in a tiny space can be a nuisance but, instead of complaining, you can put your creative hat on and start thinking of ways to decorate your small apartment. Smart storage and multi-functional furniture can make a small space more livable. 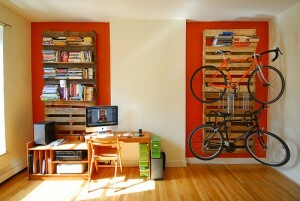 For example, you could store your books and your bike with the help of wooden pallets. Because of their structure, pallets can easily be turn into bookshelves or bike racks. Just place them on the wall, secure them, add some shelves, and you’re done. 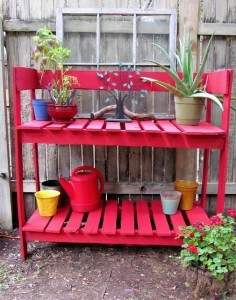 The great thing about wooden pallets are that they can be used to create all sorts of things. 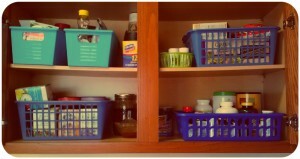 Take a kitchen shelf, for example. Sure, you could buy a fancy one from your local furniture store or you could build one yourself using a common wooden pallet. And you won’t have to put that much effort into it either! Just find a pallet, cut it in half, sand all outer surfaces and fix it over the wall. Create the atmosphere that any other sunbed would struggle to emulate with this easy-to-build pallet sunbeds. One important thing to remember though: a splinter in the back would take the fun out of your sunbed experience. So, before throwing a barbeque party, make sure the wood is sanded and has a smooth finish. Again, it is important that the wood is free from chemical spills as it might come into contact with bare skin. The angle might need some experimenting. Ideally, it should be somewhere between 30 and 45 degrees. If you are willing to spend some extra time and money on the project, you could add the ability to adjust the angle of your green sunbed. You don’t have to be a flower lover to admit that flower pots are a lovely decorative addition to any garden, terrace, or indoor space. Beautiful and colorful, they can add a touch of summer splendor to your home and garden. Although you could purchase flower pot stands, it can be more cost and space efficient to build your own. 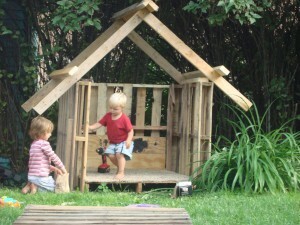 Not to mention, DIY projects using wood pallets could be fun to do with the kids or when you are bored. 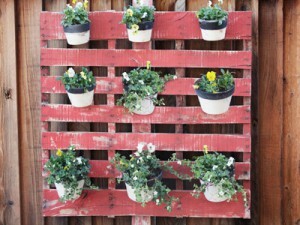 So, how about you turn a useless wood pallet intro a flower pot hanger? It’s really easy to make and requires the most basic crafting skills. In the end, you’ll have a beautiful and extremely useful hanger that takes up very little space, and can accommodate your plants and flowers. You can even move them around the back yard or hang them to create vertical garden. There’s no one stopping! 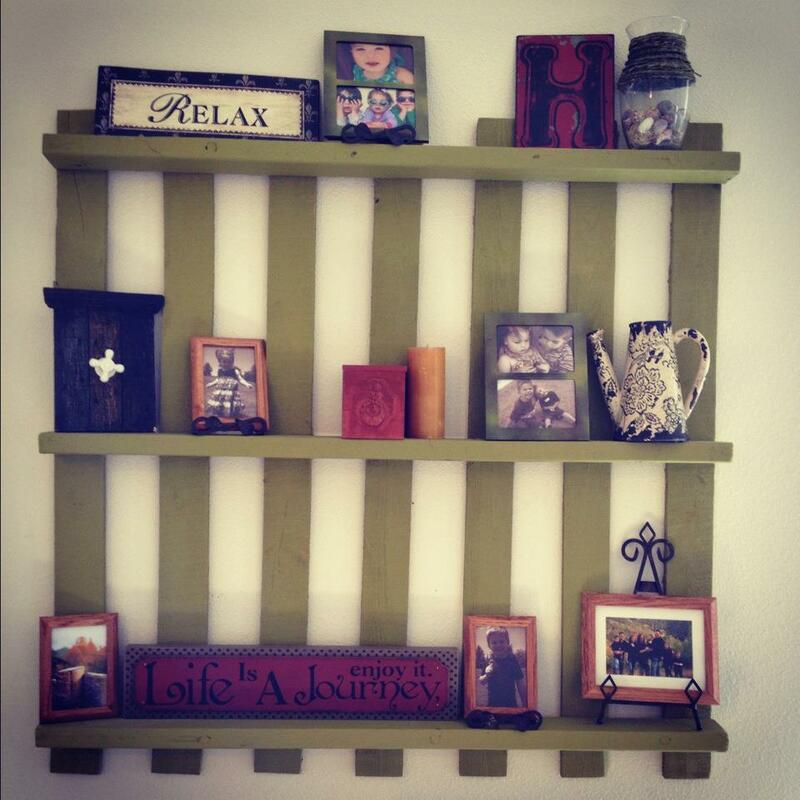 You get even more creative – you could liven up any wall by painting or remodeling the size of the wooden slats. 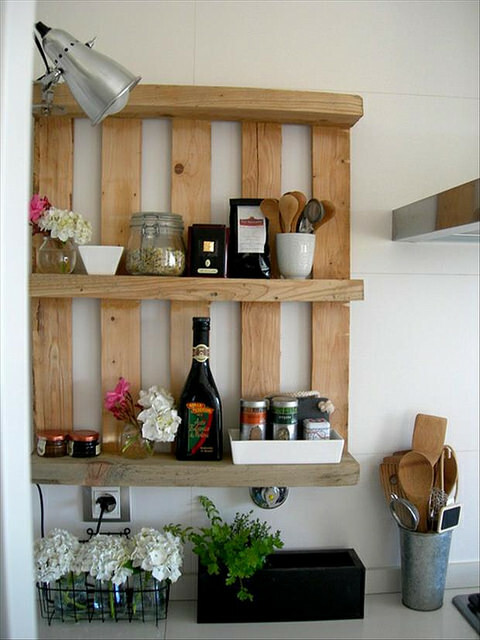 Wooden pallets can be combined and remodeled into practically anything. Take this beautiful and sturdy bench for example – it’s a piece of furniture created from an ordinary pallet. It might not be the easiest crafting project, but it’s still something you can do alone, in you spare time, with no draft sketches or special tools. In the end, it won’t matter if your potting bench is not perfectly square or 100% straight. Its imperfection will add to its beauty and uniqueness. 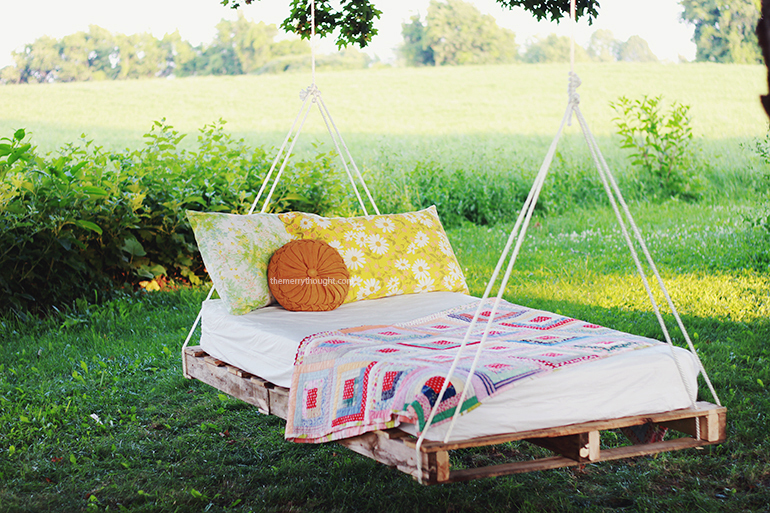 Picture this: a beautiful summer day or a sunny autumn afternoon, a good book, a glass of lemonade and a pallet swing bed on which you can lounge – what more can you ask for? Well, you could ask for some wooden pallets to turn this idea from fantasy to reality. Take a pallet slab, add some cushions, hang it from the ceiling or a tree and prepare to delight yourself everyday watching the clouds go by. If you are looking for cheap and easy ways to protect your delicate flowers, you could turn, once again, to good old wooden pallets. It will be a fun and easy activity you can turn into a weekend project. Start by dissembling the slats. Pick out the pallets you want – measure them, trim them, give them a total makeover. Now, screw the pieces together, sand away splinters and rough pieces, and there you have it – you just built a fence that cost you practically nothing. 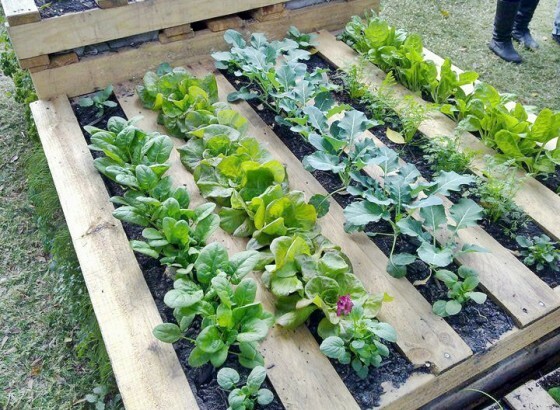 Some say wood pallet garden frames are a great way to grow flowers and vegetables. They are practically free, they don’t require any assembly, and they will add a rustic look to your garden. More than that, a garden frame cuts down the time spent weeding the plants. So, if you have some extra pallets lying around in your back yard, you just got yourself a perfect garden frame. What better way to spend a lazy afternoon than with your loved ones, gathered around a picnic table you built from scratch in your beautiful garden? What do you mean you don’t know how to make a picnic table? Believe me, you do! We all do. 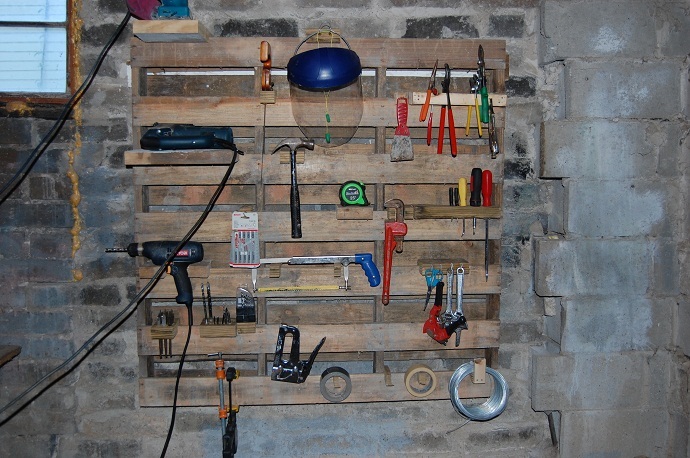 The approach is simple: get some wood pallets and re-purpose them. Take the slats apart then join them together with a bench on either side. Add some legs, secure them, sand the edges, and paint the slats. Now, all you have to do is buy a bottle of wine, some appetizers, call your friends in, and enjoy the perfect picnic. Why spend money buying a toolbox when you can craft one yourself? 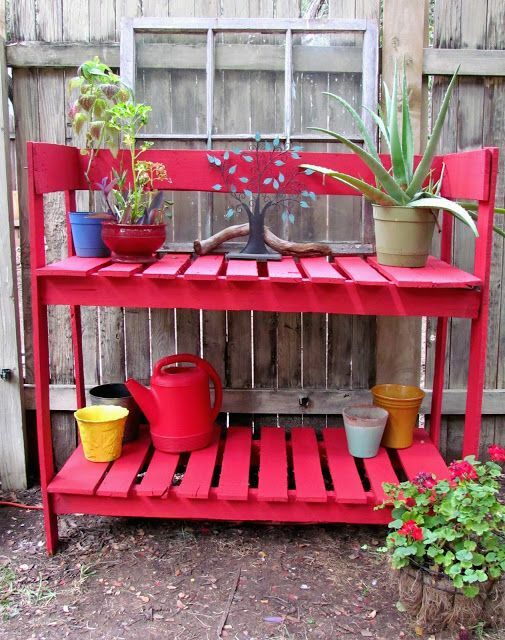 You can organize and keep your gardening tools handy with the help of one, probably free, wood pallet. Find a large pallet stand, brush it, sand the edges, and add the tool hangers. Secure the pallet against the wall and start storing your gardening tools. Perk up your garden with a beautiful garden path that requires little expense, time, and effort. 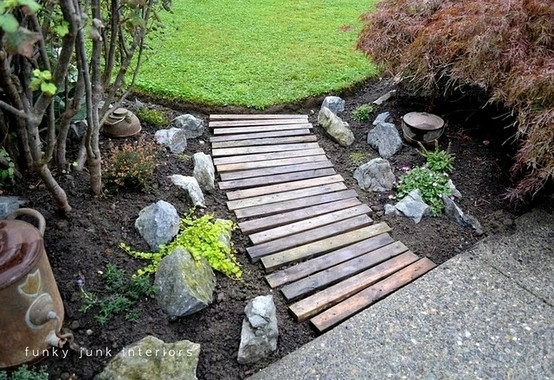 Build your own pallet wood paths and walkways through the garden. Basically, you need nothing but pallet slats to create a pavement outside your house. Complete the rustic look of your new garden path with large cobbles and boulders, old sprinkles, and other vintage looking objects. OK, this project might require some more advanced crafting skills, but we believe you can achieve almost anything with a little enthusiasm. Or you could always ask the help of a more skillfully blessed friend. If you have some time on your hand, and some wooden pallets to spare, put them to good use and build your kids a playhouse. Have other amazing pallet design ideas? Share them with us! What do you see when you look at a wood crate? Do you see a shipping container, a storage box or a pile of junk taking up space in your garage? How about, before deciding to throw it away, stand back, have a good look at it and think what can you do with an old wooden crate? Who knows, ideas might start popping! Not too long ago, a pile of wooden crates was garbage material. Now, they became one of the most wanted home décor material. Versatile pieces par excellence, they can make great furniture or home decorations. Painted or adorned with logotypes, vintage looking or with rustic patina finish, wood crates are extremely functional and really decorative. You know what they say, “One man’s trash is another man’s coffee table”. Coffee tables can be quite expensive and, in this recycle-upcycle-downcycle era, we are all about creative reuse. So, if you have some old wine crates lying around your garage, you could put them to good use and make a beautiful and functional coffee table out of them. You’ll need some basic tools and a little DIY knowledge, but don’t get intimated by the looks of it – it’s a reasonably easy project. Apartments get smaller. We, on the other hand, own more things than we can track. In a bedroom without lots of floor space, hanging wall shelves are the perfect storage for our books, photos and decorations. Wooden crates make for nice hanging shelves. 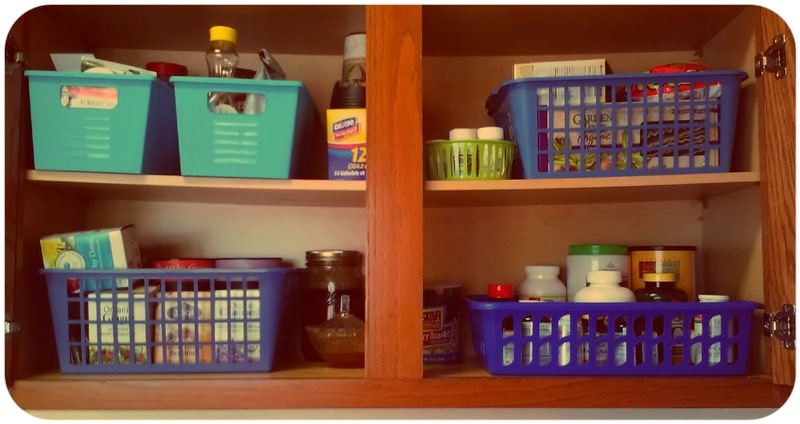 All you need to get started is: wood crates, paint, sandpaper, and wall hanging supplies. Give this DIY project a try, and make your small place feel much bigger. Storing your shoes can be pretty tricky, especially if you own a couple dozen pairs. 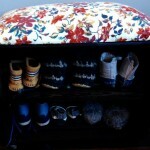 A shoe bench will help you organize your pumps and sandals, and keep the hallway neat. The only problem is that you rather spend your money on a new pair than on a shoe bench. 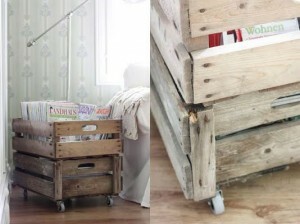 But, if you keep your mind open, you can easily make one out of cheap, ordinary wood crate. All you’ll need is a fruit or wine crate, some paint and some sturdy legs for stability. 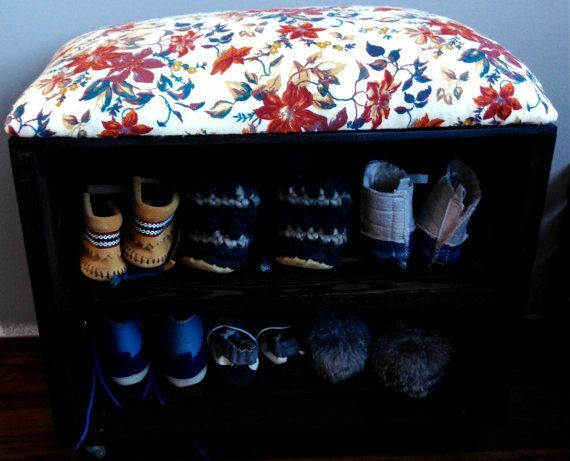 Here’s a creative recycling idea you will definitely love: an ottoman chair. A stylish ottoman chair can add a touch of class and refinement to your living room. It could also be a great hidden storage for all the remote controls, old magazines, USBs, and other objects lying on your couch and coffee table. To make one, go get yourself a two wooden crates and a cushion. Sand and paint one of the boxes, cut a chunk of wood out of the other one, and convert it to create the lid. It’s that easy! A wooden crate’s main purpose is to store different items – from fruits and vegetables to wine and medical supplies. 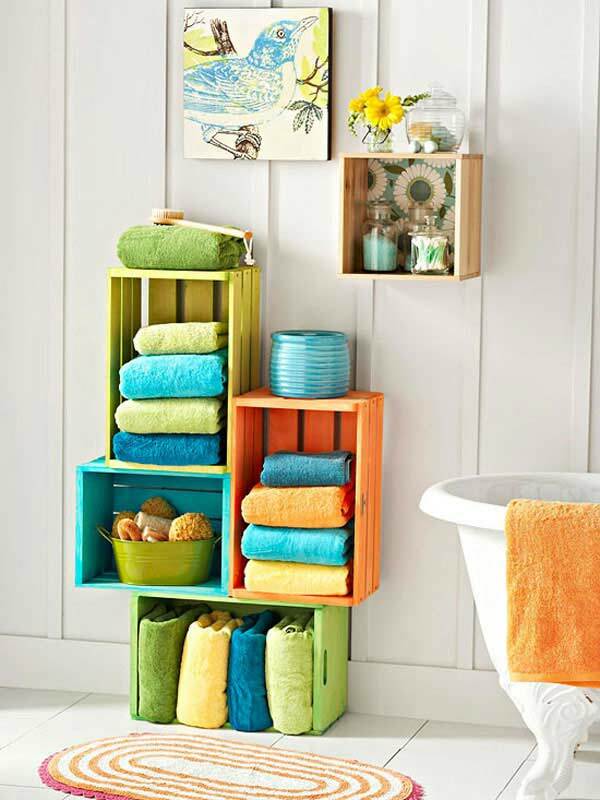 Instead of repurposing your old wood crates, you could use them as a storage solution. Paint them in different colors or add a vintage patina touch to make them both cute and functional. Now that you’re all set, you can start throwing things into them. As much as we would all love to live in a million bucks penthouse, life doesn’t work that way. And decorating can be pretty expensive. To save some money, you could craft your own furniture, decorations, and DIY storage boxes. It might sound difficult but anyone with a little imagination, some wood crates and a small crafty bone in their body can do it. Take the night stand, for example. 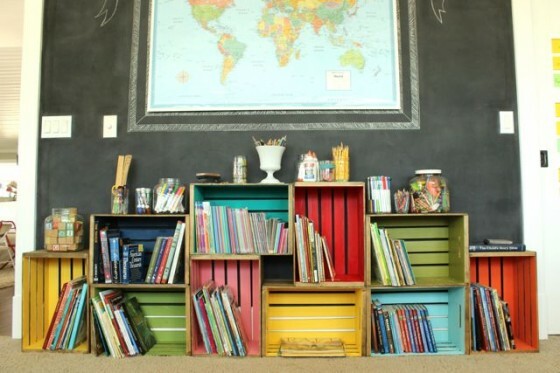 Instead of buying one from your local furniture store, buy some really cheap wood crates (really, they cost practically nothing), paint them, customize them and screw them one on top of others. If you’re like us and like to stay informed about current events, you probably have a hoard of newspapers and magazines piled up around your house. To keep the living room clean and neat, build a magazine holder from a wood crate. 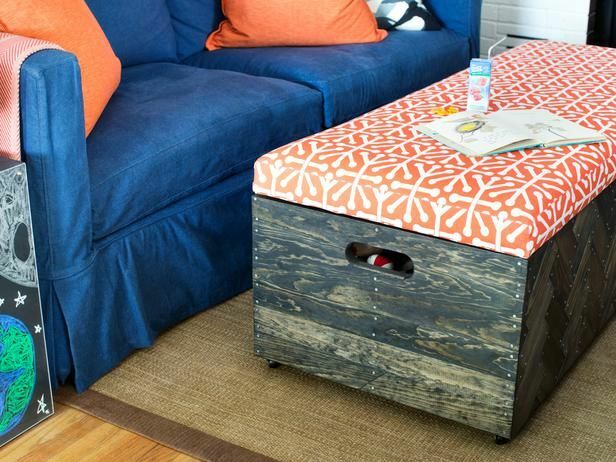 Tuck a sanded and painted wood crate next to your couch and start stashing newspapers, magazines, and books. If your pile of books is getting bigger and bigger, and you are in desperate need of a storage solution, wooden crates might be the answer you were looking for. A few customized wooden crates stacked together and secured on your living room wall will do just as well as a regular bookshelf. 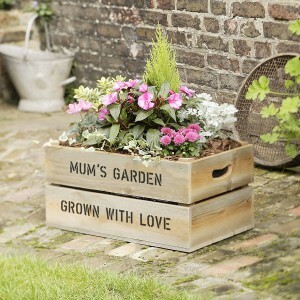 Wooden crates are great for growing beautiful flowers and fresh vegetables. You can repaint and decorate the crates to give them a vintage look. They will make a charming decoration in your garden or on your balcony. There’s something utterly charming about a bicycle’s basket. Perfect for carrying your groceries, a bike basket will make your life easier. 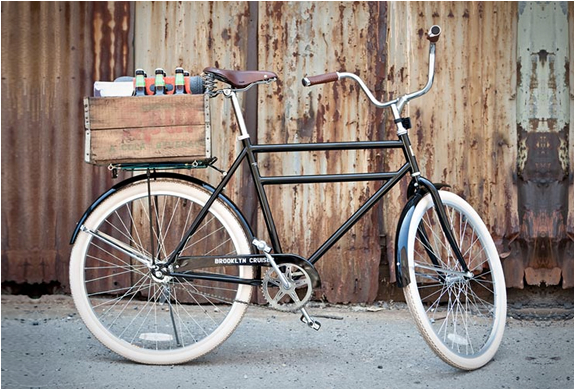 Install a wood crate on the back of your bike to make your bike prettier and more useful. 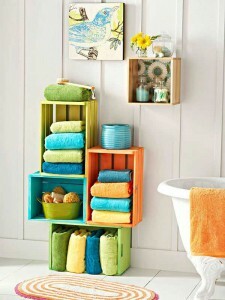 Have other amazing wooden crates design ideas? Share them with us! It’s easy to think of ways to ingeniously recycle things like wooden pallets or crates but, if you stretch your creative muscle, you could find creative reuse for other industrial containers. IBC totes, metal bins, nest totes might look dull and good for garbage, but with a little imagination, almost anything can be repurposed. Intermediate bulk containers, also known as IBC Totes or Tanks, are usually used to transport fluids. If you think outside the IBC tank, you can find alternative uses for these massive containers. 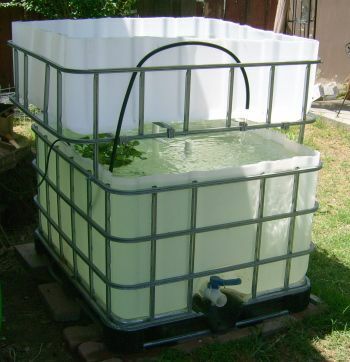 If you cut the tote apart and re-purpose the parts, you can transform this industrial container into a fish tank. Brush it, paint it, add some LED illumination, and give an old IBC tote a second life. 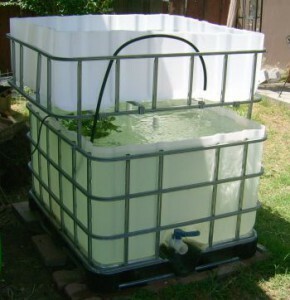 This video will show you how to make a fish tank from an IBC tote. Decorating on a budget can be really frustrating – you have to compromise and give up a lot of cute furniture pieces you can’t afford. To keep your sanity and your soul happy, you have to be resourceful and try new things. 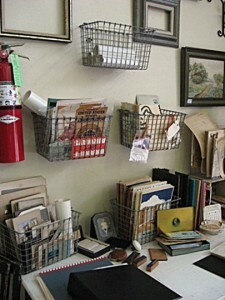 Wire baskets, for example, they look like something you can discard of. 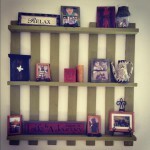 But, if you look closely you will see that they can make some stylish hanging shelves. 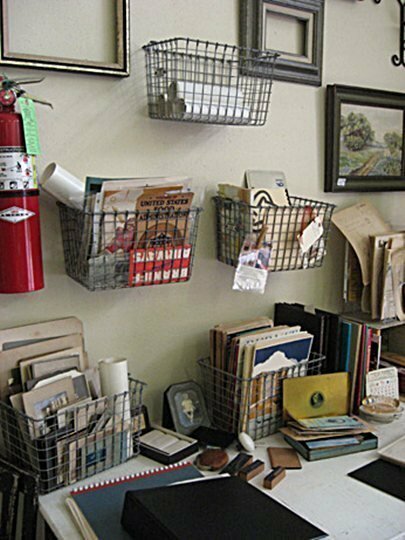 Hang a few of wire baskets on your wall, stash some books and a vase, and give your house a modern, edgy look. A nest tote might look like something you would rather hide in your basement, but with a little imagination, you can create a colorful storage supply. 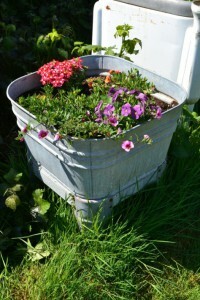 A simple makeover can turn any drab metal bin into a retro looking planter. It’s even better if the bin is rusty – the patina will add to its edgy look. 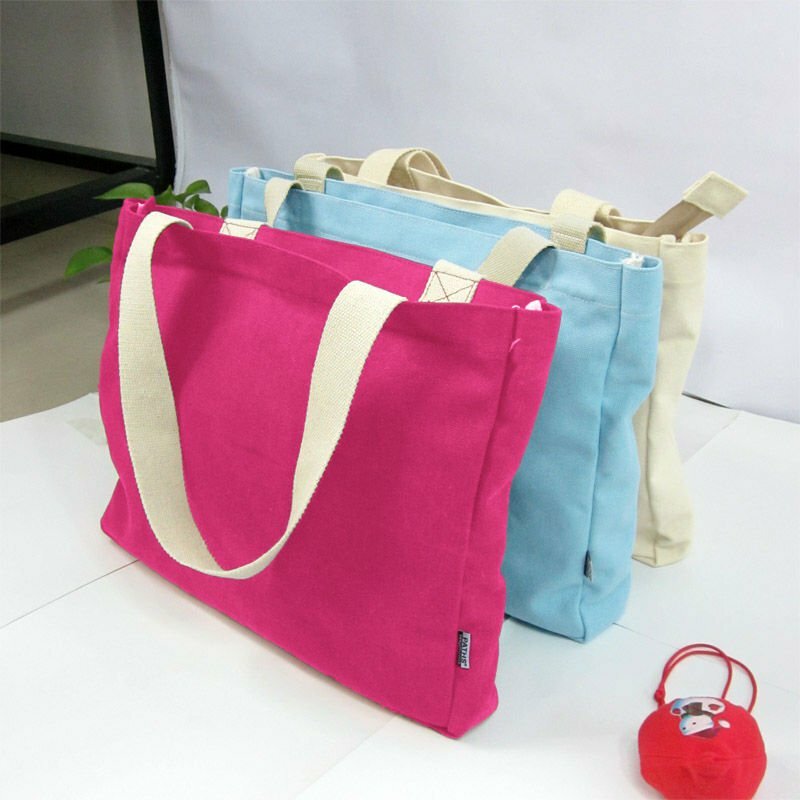 Reusable shopping bags are trendy, durable, and can last for a long period of time. Instead of spending money on designer eco-bags, you can make one from bulk bags. Add a creative design or logotype to make them more fashionable and wear them as a statement-making accessory. There’s no limit to what you can do with reusable containers, such as wood pallets, wood crates or metal bins. From easy to make kitchen shelves to more elaborate projects, they can be turned into unique pieces of furniture and home decoration. With imagination and some basic carpentry skills, you can any pallet, tote or container from industrial trash to treasure! This entry was posted in IBC Totes, Metal Bins, Nesting Totes, Organizer Bins, Pallets, Stacking Totes, Wood Crates, Wood Pallets on October 21, 2014 by madden_david. Recycling Infographic – How much waste can your company save? This entry was posted in Bulk Bags - FIBC, Metal Pallets, Wood Pallets and tagged aluminum, recycling, wood on September 15, 2014 by madden_david.